There is a relative dearth of sales management books compared to sales books. By my count there has only been a couple of good entries in this category in the past few years. That’s why I was so excited to receive an advance copy of The Sales Manager’s Guide to Greatness by Kevin Davis which I can tell you is a book every sales manager should add to their library. 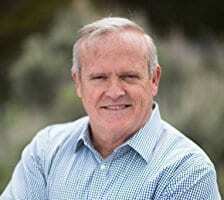 When I first became a manager I made most of the mistakes that Kevin mentions in The Sales Manager’s Guide to Greatness and the sad truth is most of managers I know have suffered the same fate at one time or another. Sales managers as a whole receive little to no training and yet I would argue that it is the most difficult job in selling. This is the book I wish I had when I first became a sales manager. The whole book takes a very pragmatic and straight-forward approach to everything. It’s all born from the field the school of hard knocks. Kevin tends to keep things very tactical throughout which means it’s very easy to implement. It’s literally oozing with practical tips on every area. Kevin covers a total of 10 strategies that are truly essential for managers and I started enjoying the book right from the beginning with his guidance on mindset and productivity as applied to sales management. He offers tips on how to avoid being reactive, what your priorities are and how to turn the constant interruptions and fire drills of management into sanity. Kevin kills many sales management myths in this work and offers some paradigm-shifting advice around becoming more customer-focused in both sales process and forecasting that will truly make a difference if embraced. There is sage advice around hiring, accountability, sales rep motivation and perhaps most importantly – coaching. 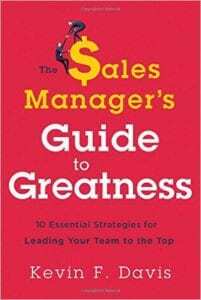 The Sales Manager’s Guide to Greatness fills a dire need out there in the sales management world. Here is relevant and proven guidance on not just how to be a coach, but how to be a great one. And not just how to be a leader, but how to be a great one. 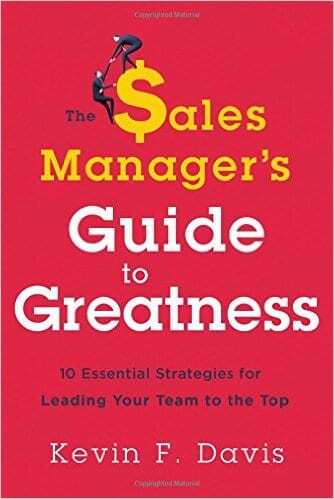 I recommend The Sales Manager’s Guide to Greatness to every sales manager regardless of industry. It’s practical, inspirational and actionable – everything I like in a book. 5 stars.